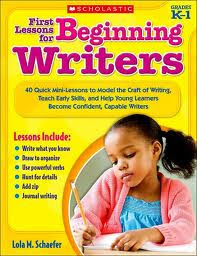 This week's writing tips come from the book First Lessons for Beginning Writers by Lola M. Schaefer. I found this mini-lesson "Stretching Star" and thought it was a great idea. Give everyone of your students the chance to be a "lead" stretcher in order to help them strengthen and show off their skills in stretching words. - Choose one student each day to be the "Stretching Star." - Have the child stand at the front of the group with you. Introduce the "Stretching Star" to the class. - Choose a word and have students watch your lips and listen as you stretch the word. Then have them stretch the word with you. - Have the "Stretching Star" stretch the word two different times in his or her loudest voice for the class. Encourage the "Stretching Star" to speak slowly and loudly so everyone can hear. Be sure to have him or her stretch the word correctly twice before asking the rest of the students to join in. - After the "Stretching Star" stretches the word correctly twice have the rest of the class join in to stretch the word. -If the "Stretching Star" has trouble or stumbles over the word simply repeat the process until the student is successful. -After everyone has stretched the word several times use chart paper to write the word. -Have the "Stretching Star" slowly stretch the word as the class calls out the letters for the sounds they hear. Call different students to come up and write the letters they hear on chart paper. You can also use this idea and choose a "Stretching Table Star." Ask one student from each table to be the "Stretching Table Star" for a week at a time. The "Stretching Table Star" can help their table mates to stretch words they are trying to use in their writing. I especially like this idea for those students who have trouble stretching words or for those who are reluctant to do so. I have this book and LOVE it! This is a great idea. I may need to check this book out. I love this idea! Super cute and a great way to build of the confidence in our little writers. This is such a great idea!!! I'm using it for sure. Thanks for sharing! This is a great idea! I am just reading the book Talking, Drawing, Writing to strengthen my Kindergaren writing program and this tip is a great fit for me. Last year we stretched out the word and then banged our fists together as we pronounced it properly. Thank you. Oh, I love this! I'm in school to be a teacher, so I'm always on the lookout for ideas for my future classroom. Definitely tucking this one away for future reference.